The Workshop will be in Chipley on March 14, 2019. Holmes, Jackson and Washington County Tourist Development Councils in partnership with the UF/IFAS Extension Washington County will be holding an agritourism workshop entitled “Keeping Your Agritourism Farm Fresh.” The workshop will be held on Thursday, March 14, 2019 at the Washington County Agricultural Center located at 1424 W Jackson Avenue in Chipley, and is funded in part by a Tourism Education Grant by Visit Florida. The workshop will cover many basic topics to help farmers take the first step towards encouraging tourism on their farms. This workshop will be the first of a series aimed at helping local farms work through the process of starting a successful agritourism operation. 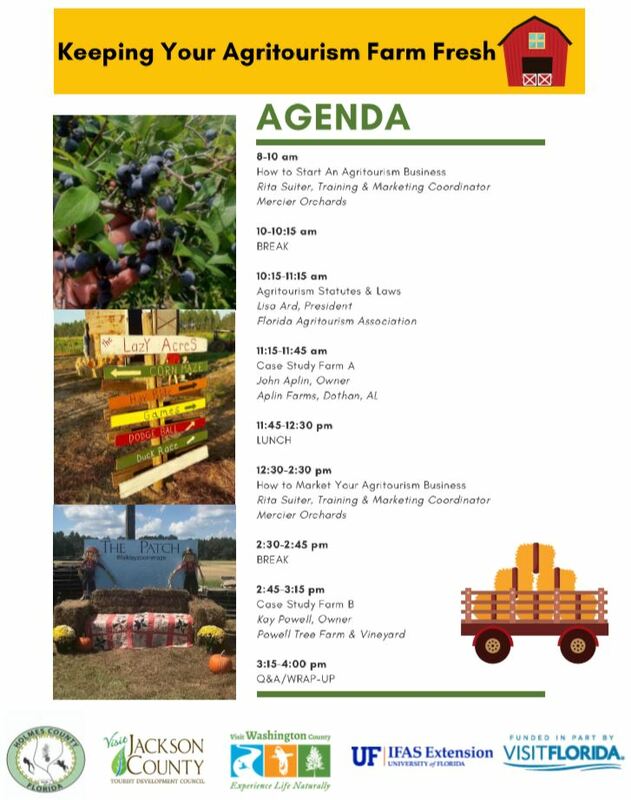 The main speaker for the day will be Rita Suiter, Marketing & Training Coordinator for Mercier Orchards in Blue Ridge, Georgia, as well as the owner of Five Star Customer Service Strategies, LLC, and a professor at STS Marketing College in Dahlonega, Georgia. Ms. Suiter’s presentation will be broken into two segments. The morning segment will focus on how to start an agritourism operation on the farm, and her afternoon segment will focus on the marketing of that business. 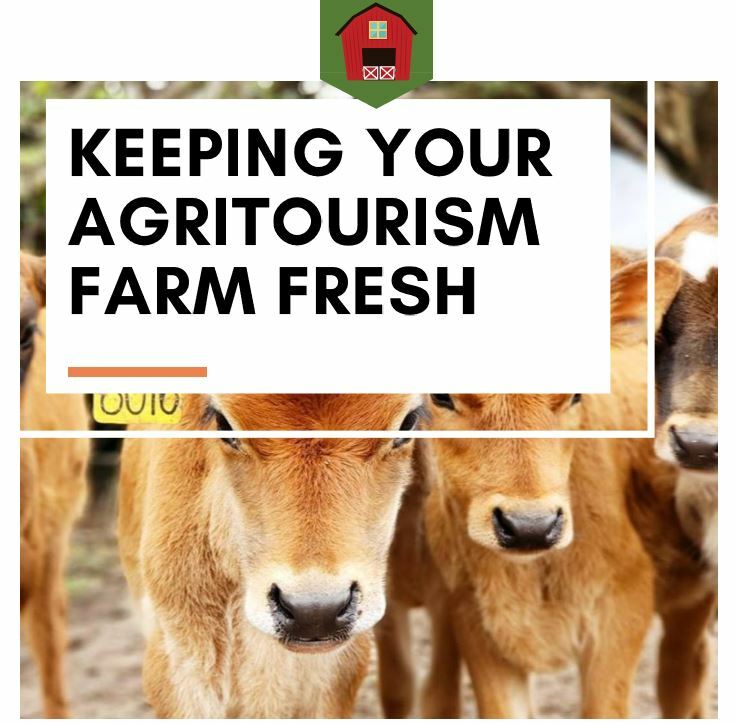 The workshop will also include a talk on agritourism statutes and law by Lisa Ard, President of the Florida Agritourism Association, and two farm case studies by Aplin Farms of Dothan, Alabama and Powell Tree Farm of Sneads, Florida. A vendor room will be provided to offer helpful products and information on insurance, loans, marketing tools and grants. The workshop registration fee is $20 and includes coffee and lunch. To register, please visit visitwcfla.yapsody.com. For additional information, please contact Heather Lopez with the Washington County TDC at (850) 638-6013 or director@visitwcfla.com. I am the Agriculture and Natural Resources agent in Washington County. My program areas include livestock and forage, row crops, and pond management.